PHOTO: Tune into Sandals Resorts Webinars for great information about Sandals Montego Bay and other great properties. 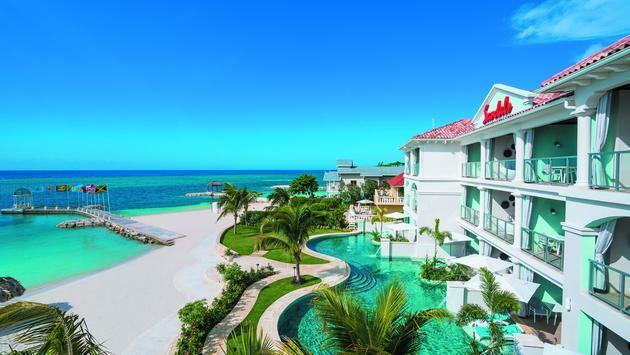 The Sandals Resorts brand has long been renowned for its five-star vacations for couples in love. And it all started in Jamaica in 1981 at Sandals Montego Bay, which was the recipient of a $60 million property-wide transformation. “Sandalized” was how Adam Stewart, deputy chairman of Sandals Resorts, described the renovation. “The sun, sand and sea will always remain a constant, but it is innovation that has made us the company that we are today,” he said. The resort attracts honeymooners and wedding parties, as well as couples interested in renewing their vows or celebrating an anniversary. You will find plenty of guestroom and suite options to meet the needs of these client types. 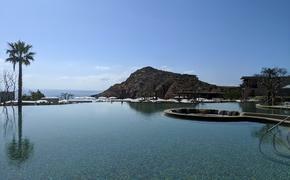 In all, the property accommodates 544 guests with 272 rooms and suites of varying categories. Accommodations have been updated with natural wood and other environmentally friendly materials and with outdoor tranquility tubs. The beachfront, swim-up and butler suites are the newest to be remodeled and are very popular, as are the beachfront Romeo & Juliet villa suites with butler service. Unlimited dining and premium-brand alcohol beverages; all watersports (including scuba diving; Wi-Fi, exchange privileges with two nearby Sandals resorts; airport transfers; and tips, taxes and gratuities. Tell your clients not to miss the Beach Party, which features Jamaican dishes and music. There is also live music throughout the resort, a piano bar, fun and games at an English Pub and planned theme nights. The resort debuted two new restaurants, Butch’s Steak & Seafood and Soy Sushi, and Latitudes, an over-the-water bar. The Oleander Room, which serves Jamaican cuisine, was transformed from a buffet restaurant into one featuring white-glove service. The Bayside Restaurant serves international cuisine, buffet-style breakfast and lunch, and an à la carte French Brasserie experience at night. Cucina Romana offers Italian specialties, Tokyo Joe’s serves up stir-fry options, The Cricketers Pub brings a bit of England to the table and Café de Paris features sweets. On and around the beach, couples can enjoy Caribbean seafood at Stewfish, Jamaican Jerk at The Jerk Shack, and a variety of other options at Mariner’s Seaside Bar & Grill and Dino’s Pizzeria Italiana. Market to newly engaged couples, those interested in renewing their vows and anyone celebrating an anniversary. Consider past Sandals guests and position the resort as “going back to the place where it all started.” Focus on group bookings by promoting the resort as the perfect spot for a destination wedding, with an Over-the-Water Serenity Wedding Chapel. The Certified Sandals Specialist Program provides training, co-branded marketing materials, support from local BDMs and regional directors, and free stays through the Points to Paradise program. A version of this article appears in print in the March 2019 issue of AGENTatHOME Magazine.